I am grateful that I stepped forward for the opportunity to be your, Hiro’s, demonstration client for 2017 faculty meeting. This was a courageous act for me – sharing myself in this way in front of a group – as I am a rather private individual. My curiosity to understand and experience the work that Hiro brings forward was compelling. I wanted a felt-sense exploration. The session proved to be one of my more profound Rolfing® Structural Integration experiences. 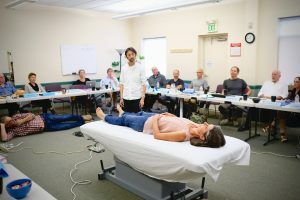 In response to your question, Hiro, of what I was noticing as I stood in front of the group at the beginning of the session, I verbally shared that I felt a notable and long-lived discomfort deep in my right hip and that I felt more weight in my left side and through my left leg. When walking, I felt more ease, fluidity, and more anterior:posterior motion of my left ilia relative to my right. There was a “hitch in my giddy-up” on my right side and my low back ached. While lying supine on the table, eyes softly closed, I gradual became more peaceful and much more aware. The growing rich awareness included the physicality of my body, the spaciousness of my being, and a novel type of dialog . I remember a gentle curiosity as I felt into and within my cells. I noticed the space and texture between cells. There was time of discomfort around the left side of my peritoneal bag – internally with organs and also with visceral connections inside and outside of peritoneal bag. Some time passed and what I remember next were very intense connections and attentions at my right side in and around L3 to L5 and the associated areas of my spinal cord and dural tube. It felt like very specific and refined palpations that keenly invited my attention. The refined “palpations”, connections and attention had a quality of accuracy, clarity and refinement that I do not remember ever experiencing before when touched. I recall a feeling of building focus and sense of sorting that brought ease and relief. During this entire time lying supine I believe you physically, hands on, lightly and briefly touched me once on my leg.